Panasonic delivers an upgraded ANC experience with their RP-HC56-K noise cancelling earbuds. Compact and stylish, these earbuds deliver good performance in a travel-friendly package. For an average cost of less than $50, these earbuds perform quite well when compared to other brands more than two or three times the price. The RP-HC56-K deliver reliable active noise cancelling that is perfect for commuting or traveling. They do a good job of cancelling out engine and cabin noise as well as road noise. There is a fair amount of sound leakage due to the open driver/enclosure design that is common with many ANC earbuds. This may be an issue if you use them in quiet rooms or office environments. The components and assembly of these earbuds are decent quality, and a carrying pouch is included to help protect them from minor damage when traveling. The cables are prone to some tangling, but that is just a simple nuisance and not really a product durability concern. When these earbuds work, they work very well, but it seems that a few users have experienced a “whining” or high-pitched sound when the ANC circuit is engaged. This is likely due to an electronics or component malfunction and should be covered within the standard 3-month warranty period if you experience the issue. Another weak component worth noting is the in-line slide volume control. It may be possible to damage the control with excessive pressure or mishandling. The lightweight design and interchangeable eartips provide a high level of comfort. Pressure points are minimal and the cables worn down under the ears keeps wires from interfering with eyewear. Panasonic seems to have thought through one other design feature that adds to the comfort level – a small clip on the back of the pen-style tube easily attaches to pockets or clothing for easy carrying. 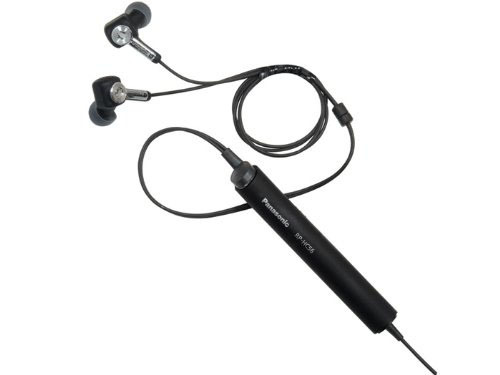 The Panasonic RP-HC56-K uses a small cylindrical tube to house the AAA alkaline battery and active noise cancelling electronics. A fresh battery can last up to 40 hours. The ANC circuit is easily engaged by pushing the on/off button on top of the in-line battery and electronics tube. A red light illuminates to indicate the device is on. A slide volume control is also located on the tube, but there are no other controls for device playback or an in-line microphone for talkback functionality. Also in the box are an audio adapter plug for 3.5mm to dual airplane headphone jack and a soft cloth carrying pouch. Audio purists may not fully appreciate the sound quality of the RP-HC56-K earbuds, but they sound pretty good for the average listener. Music is easy to listen to and content for movie or audio book playback is very clear. The bass is slightly exaggerated, but these aren’t going to be delivering pounding low frequencies for bassheads. Mids and highs are balanced for a pleasing playback experience that isn’t shrill or harsh. Overall volume and power performance is reasonable, but you’ll want to make sure not to overdrive these earbuds, as the audio quality diminishes at higher levels. As noted earlier, if the ANC circuit becomes defective you will likely hear a high-pitched whine or squeal from one or both of the earbuds. This is really the only notable audio concern with these earbuds. While these are not a premium or boutique-quality set of earbuds, they are perfectly suited for the casual traveller or even as a backup set for the road warrior. Panasonic’s RP-HC56-K noise cancelling earbuds are a solid product at a great price. They offer quality active noise cancelling and an agreeable listening experience.